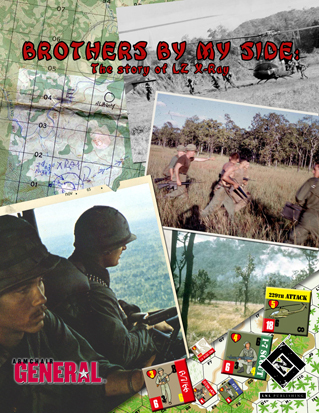 Brothers by my Side: The Story of LZ-Ray is a simulation of the air assault by the 1-7 Air Cavalry Battalion into the hornet’s nest of three North Vietnamese Army (NVA) regiments, and the American’s subsequent 72-hour fight for survival. The player controls –by moving cardboard counters across a map and combating enemy formations— the American and Vietnamese formations that fought in the battle. The map covers Landing Zone X-ray (LZ X-Ray) in South Vietnam’s Ia Drang Valley, and the surrounding area. The counters represent infantry platoons (40-60 men), machinegun sections (4-7 men 2 machineguns), mortar batteries (4-6 tubes), and helicopter sections (2-4 helicopters). Each turn represents approximately 15 minutes. This complete downloadable PDF game features the beautiful art of Nicolas Eskubi, and can be printed and played in less time than it takes to watch a couple of episodes of Sponge Bob. Fun, simple design, drop-jaw graphics, and no shipping! It’s a wargamer’s dream. 125 beautifully illustrated counters, representing infantry platoons, mortars, machingun sections, attack and transport helicopters, NVA, and VC. Twenty-four action cards that invoke special events, such as lost Anerican platoons and sneak attacks. One 11" x 8.5" map covering the key section of LZ-Xray over which the battle was fought. Easy to learn game system. Complete game has seven pages of rules. Three scenarios -- Not Enough, Duck and Run, and By My Side-- covering the different facets of the battle. 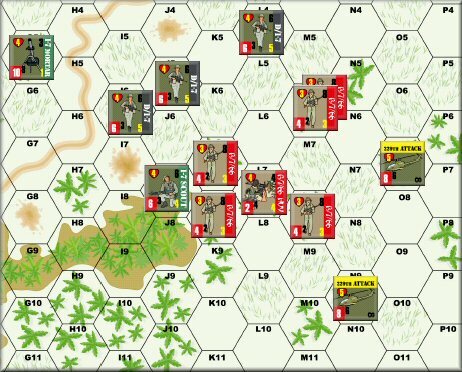 Michael Socey 7 9 8 Good tactical Vietnam wargame. Well written rules. The only concern is whether a print and play game with a 8.5x11 inch map and less than a 130 counters rates a price tag of $14.95.